Selection of 600 dog and cat figurines. 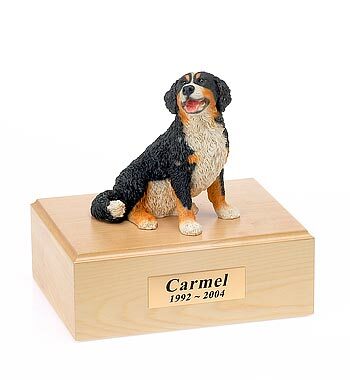 Our most popular urns are our Traditional Edition pet urns personalized with your choice of figurine. What a wonderful way to remember your loved one. You'll have a truly unique wooden pet urn because our figurines are masterfully crafted with stunning detail. Choose from a variety of dog urns, cat urns, as well as pet cremation urns for rabbits, ferrets, parakeets and horses. 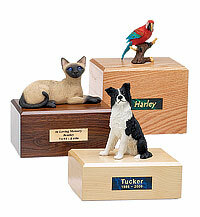 You can place the figurines atop any of our pet urns or beside them. Each lifelike figurine beautifully compliments our urns which are made of either Maple, Red Oak or Walnut. We offer four sizes of pet cremation urns and our largest urn can accommodate pets up to 120 lbs. Our Traditional Edition figurine pet urns can be personalized with a solid brass nameplate which includes an inscription of your choosing. The inscription on your wood pet urn may be one, two or three lines and you have a choice of nameplate colors to compliment your dog or cat urn. You can choose between Gold Bright Brass, Blue Marbleized, Brown Marbleized or Green Marbleized. For nameplate colors and inscription styles please visit the nameplates page. Your pet's bagged cremains are placed in the wooden pet urn via a removable bottom panel that is secured by four screws. Black felt covers this bottom panel and the panel has four rubber feet to protect the surface where the pet urns will be placed. Please refer to our Frequent Questions page for directions on how to place your pet's cremains into your Traditional Edition pet urns. We rec'd the Urn and Figurine with out any problems. It turned out better than I had expected, very good workmanship. I will certainly recommend your company to my friends and family. Yes, the urn arrived safely and we are very happy with the quality and workmanship. We have placed the urn in a special place in our home to remember Belle. She will always be in our hearts.